Newport, R.I. - Kevin Winterrowd has been promoted to manager of the 2019 Newport Gulls after serving as the team's pitching coach the past two seasons. He will be heading a team seeking to capture a league-leading seventh championship in team history after not reaching the playoffs each of the past two seasons. Winterrowd is no stranger to Newport or the New England League. The Yukon, OK native has been in and out of the league in multiple capacities since 2001, beginning as an assistant coach for the Keene Swamp Bats. He managed the North Adams Steeple Cats during the 2002 and 2003 campaigns and then joined the Newport Gulls in 2010. Winterrowd was an assistant coach for long-time manager Mike Coombs, instructing the team's hitters and infielders along with coaching third base. 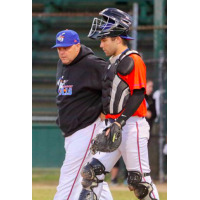 Winterrowd's most recent stint at the helm of a New England League franchise came in 2013 when he led the Keene Swamp Bats to their fourth league title in 2013. Keene recorded 27 regular season wins under his guidance en route to the being named NECBL Manager of the Year. "Newport has an atmosphere rivaled by few and it starts with leadership," Winterrrowd said. "The organization has been run well since the beginning, I'm honored to be a part of it." Throughout his time developing talent in college baseball, Winterrowd has coached 100 former players that have either been drafted or signed professional contracts. He has also been a national scout for USA Baseball in Cary, NC, where he was responsible for evaluating and selecting players for the 17U National Development Program and National Team Identification Series. "I enjoy developing the kids in a competitive environment," he said. "My goal is to send them back to school as better ballplayers than we got them." Jack Patterson (Bryant University) pitched for Wintterrowd in 2017 and is currently in the Chicago Cubs organization; "Coach Rowd' is going to do great because of his ability to keep us players focused and to not overthink." Patterson went on to say, "I remember I wasn't even on my ride back home and I received a lengthy text about the season stating we will always be Gulls Family, and to let him know if there was anything he could ever do for me- that stuck with me and spoke to his sincere desire to see his guys succeed". "We are excited to have Kevin take on this role. He knows the league, he knows Newport, and he knows how to win. The team is ready to get back to the championship and Coach Winterrowd is a great man to help us do so. "- Newport Gulls General Manager Chuck Paiva. The Gulls will open up the 2019 NECBL season on June 5th when they host the Mystic Schooners at 6:35 p.m.